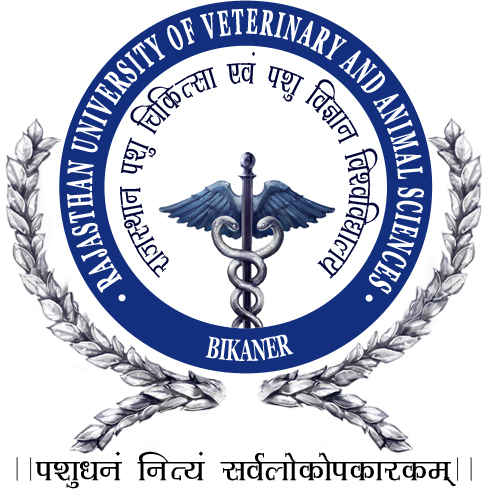 The Rajasthan University of Veterinary and Animal Sciences (RAJUVAS), Bikaner is a newly constituted body corporate established under sub section (3) of section 1 of the Rajasthan University of Veterinary and Animal Sciences Act, 2010. The University came in to existence on 13th day of May, 2010 with His Excellency the Governor of Rajasthan as the Chancellor of the University. Professor A.K. Gahlot was appointed as first Vice-Chancellor of the University. The Headquarter of Rajasthan University of Veterinary and Animal Sciences is located at Bikaner. The College of Veterinary and Animal Science, Bikaner was established in 1954 in heritage buildings. The College awards undergraduate degree of B.V.Sc. &A.H. and offers M.V.Sc. course in 15 subjects, M.Sc. in one subject and Ph.D. by course work in 12 disciplines. There are seven Livestock Research Stations at Bikaner, Beechhwal (Bikaner), Kodamdesar (Bikaner), Chandan (Jaisalmer), Nohar (Hanumangarh), Navania, Vallabhnagar (Udaipur) and Bojunda (Chittorgarh). The University also has 65 institutes providing 2 years Diploma Programme in Animal Husbandry after 10+2 spread over whole Rajasthan producing about 3000 para-vets annually. These institutes are in Bikaner, Alwar, Bharatpur, Churu, Dausa, Dungarpur, Hanumangarh, Jaipur, Jhunjhunu, Jodhpur, Karauli, Kota, Bundi, Baran, Sriganganagar, Sikar, Tonk and Udaipur. Four new centers at Post Graduate Institute for Veterinary Education and Research, Jaipur; LRS, Chandan; LRS, Nohar and CVAS, Navania (Udaipur) have also started offering Diploma in Animal Husbandry as constituent units, besides the one at the College of Veterinary & Animal Science, Bikaner. The Research centre located at Jaipur has been converted to Post Graduate Institute for Veterinary Education and Research facilitating PG courses in three streams.